If you work hard, play the game and take your opportunities then one day you might make it as a PRO RIDER. I have always wanted to go to Union Island and the Grenadines. I have heard nothing but good things about these southern islands in the Caribbean chain with the most untouched, untraveled, raw Caribbean vibes. So when I heard about the Slingshot shoot on the Wind Voyager boat I was so excited! The boat was anchored in Union Island, a small idyllic island south of the Grenadines, with a population of less than 3000. It’s a bit of a pain traveling to Union Island, which is what keeps special places so special. If it was easy then everybody would go… So I flew direct from London to Barbados and then down to Union Island on a small eight-seater plane; there were only two people and myself on the plane down. I spotted our boat ‘Cartouche’ from the plane flying in as it was twice as big as all the other catamarans in the bay! Then, after landing, it was a quick ride on the tender out to Cartouche. We had a solid Slingy team to make the most of the opportunity; starting with Karolina Winkowska, one of the greatest female shredders of all time. 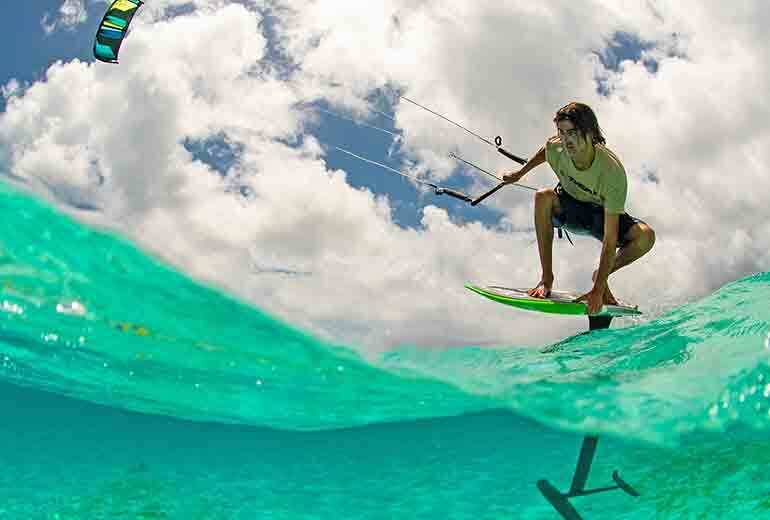 Fred Hope, foil wonder-teen who’s carving his own path in the industry dancing on a foil. Patrick Wieland, filmer/drone pilot extraordinaire. Alex Fox, artist/brand manager and leader of this motley crew. Mo Lelii, a photographer Fox went to school with, and myself, the veteran photoshoot guru! It was a streamlined crew as there was only so much space on the boat. 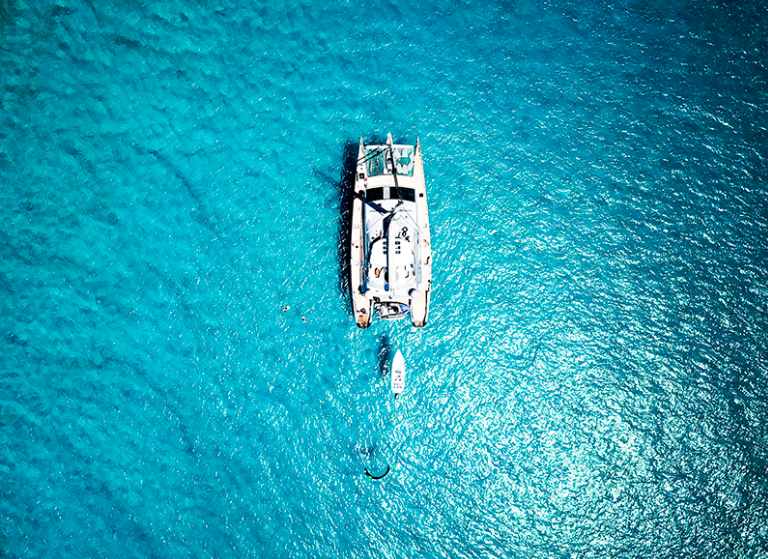 We started the trip on Union Island at ‘Frigate Rock’ which is an idyllic flat water spot, perfect for mooring the boat and kitesurfing straight off the back, turquoise water and white sand beaches scattered with palm trees making it hard to take a bad picture! We spent the first 24 hours here to bag some content, the wind was light for the first day but foiling has changed the game and we were all flying around on the new foil range in 10 knots. Only stopping off for refreshments and more sun cream while your kite flies off a cleat at the back of the boat. Karolina even managed to get out on her signature Karolina Pro twin-tip. After the session, we jumped straight in the hot tub to soak it all in! I don’t think any of us have ever experienced such luxury; the dinner table was already set with white gloves (to ensure no fingerprints) and we sat and enjoyed fresh tuna steak and talked through the shot list and schedule for the week. Unlike a lot of the Caribbean, the wind in Union Island is strongest in the morning this time of year and the forecast looked good for a sunrise session on the first day so we set our alarms for 5am to catch that morning golden hour. We hammered out a load of product shots using the ‘over/under’ port so you can see both above and below the water as it’s crystal clear. So we knocked out loads of important shots until we stopped around 10am for an insane breakfast on the boat. Rehydrated, we went for a cruisey GoPro foil session. After a late lunch, we packed up the tender and headed into the beach at Frigate. The boys set up a long lens on the sticks and we went about trying to land some cool tricks. It was a huge first day, and we probably got more on the first day of shooting than we ever have before. After a hard day’s work of about six hours on the water, it was time to get in the hot tub on the flybridge and crack a well-earned beer! Riding for a photo-shoot is very different to freeriding. We have a shot list and we grind it out until we have everything we need. There are so many variables to contend with so you can’t always stick to a fixed plan, you have to be able to adapt to the conditions to get the most out of every moment. People think we just have a jolly up during the shoot, but we work hard all week, and it’s generally the most physically demanding week of my year! Waking up at 5am every day for the sunrise and spending all day on the water grinding the shots. Your body falls apart, it doesn’t matter how much sun cream you put on, you’re still sunburnt as we are in the sun for at least 10 hours a day. Don’t get me wrong, I am very grateful to do what I love for a living and have these opportunities to go to amazing places, but we work hard for it. It’s not like we’re smashing beers every night, we are in bed by 8pm. Creating content motivates me as much as freeriding, getting a good shot of something simple is as good as landing a trick you have never done before, I really enjoy doing the best possible job I can. It’s all about making the most of these opportunities! That next morning, we had another crack on the 2019 Slingshot twintips before pulling anchor, hoisting the sails and heading to our next destination. Fred wouldn’t stop foiling so we left him out on the water and he kited alongside the boat as we sailed about 40 minutes to Petite St Vincent and the sandy island of Mopian. The wind was just enough to foil so we foiled our brains out on both the Hover Glide and Ghost Whisper hydrofoils, all afternoon. Petite St Vincent is a tiny Island with a posh hotel on it and a cracking beach bar, the wind dropped and our captain Angelo spoke highly of the cocktails so we thought it would be rude not to go ashore and sample the local produce. The cocktails were great! The next morning we sailed to Tobago Cays, one of the prettiest places in the Caribbean, if not the world! Tobago Cays is a small cluster of beautiful islands with crystal clear water and a big reef protecting the windward side. 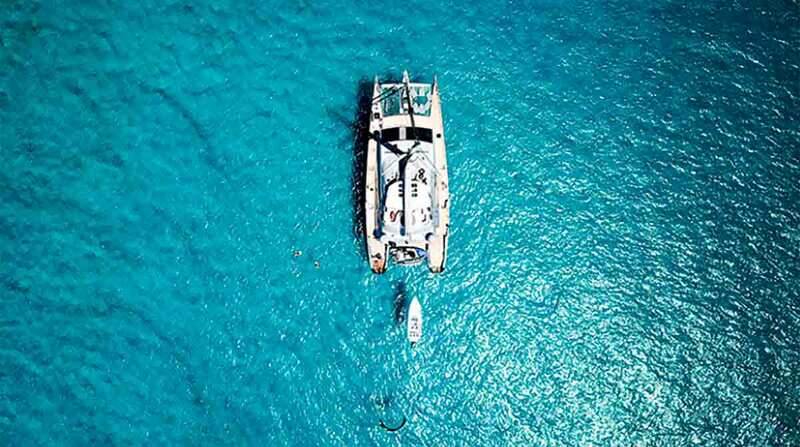 This makes it the perfect spot to anchor your boat in the sheltered area and explore the islands and reef. It is so breath-taking, they filmed parts of Pirates of the Caribbean here. As you can imagine it’s a popular destination for charter boats, there were loads of boats but that made it really fun kiting amongst them as they looked on in awe, as our squad of foils weaved between the tall masts. We stayed here for a few days because there was so much opportunity and variety to get good shots. We spent an afternoon shooting over/under shots on the reef, and a morning shooting off one of the islands. We even managed to go snorkeling with turtles. We had pretty much got everything on our shot list by this point, everything else was now a bonus. We had one last shot we talked about that would involve everyone on deck, the money shot of us kiting alongside the boat, under sail. It needed everything to line up without any hiccups. The media crew jumped in the tender for the crossing and Fox, Fred and myself launched off the boat and kited around while they hoisted the sails and Cartouche set sail on a broad reach towards Union Island. It was so cool kiting around the boat, but it was really hard and scary to kite in front of the boat, the wind shadow was so big that if you were out of position, your kite would fall out the sky. So it took a team effort but we got the money shot! As we went past Palm Island we noticed some swell on the point. We pulled in, dropped anchor, jumped on the tender and spent a few hours tow-in foil surfing, it was a lot of fun and we all got some good waves. The icing on the cake. That evening we continued onto Union Island for a cocktail on ‘Happy Island’. Happy Island is a bar built on the reef, less than 30ft wide, built on conch shells next to the anchorage of Union Island and the kitesurfing spot. 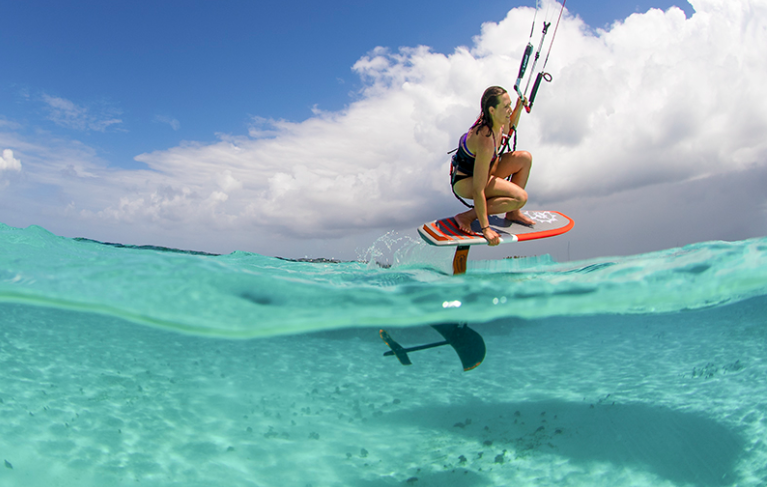 When it gets windy, the kitesurfers jump over the island as the on-looking sailors watch on with their jaws on the floor! We spent the last days hoping to do some freestyle and jump over Happy Island but there wasn’t much wind, only enough to hydrofoil. On the plus side, this just means we’ll have to come back and do it again next time. What a trip! Sam to Fred: Was this really your first time riding without a wetsuit and how did you find the trip? This wasn’t exactly my first time kiting without a wetsuit, but it was the first time I’d gone shirtless and didn’t freeze while on the water! The Gorge and La Ventana don’t have incredibly warm water in their wind seasons so I always go with one just to stay cozy. I also get cold really easy. Right now I’m back home in The Gorge and it’s 25°C and the water is probably 18 but I’m still rocking the 5/4! Then the trip was incredible and it was way more than I expected. Fox kept the details to a minimum and all I knew was that we were going on this boat off Union Island. Freeriding is so much easier than a photo shoot. You can go wherever you want when you’re out freeriding and don’t necessarily have to land every trick you attempt. For a photoshoot, you want to land them on camera as fast as possible so you can get onto the next trick. We sailed to a couple different places. I’d have to say my favorite was Tobago Cays. The colors of the water and the abundance of turtles blew my mind. We were weaving through the sailboats on foils with some people yelling at us to get away and others telling us to get closer so they could get video of us! Sam to Karolina: Was this your first boat trip? How was it living on the boat for a week and how does it compare to other kite trips living on the boat? Coming to Union Island and staying on the Wind Voyager boat was like a dream come true! It’s definitely an ultimate paradise and a trip that I will always remember. It wasn’t my first boat trip but the first time in the Caribbean and first time on a 95 foot cat full of kiteboarding gear! 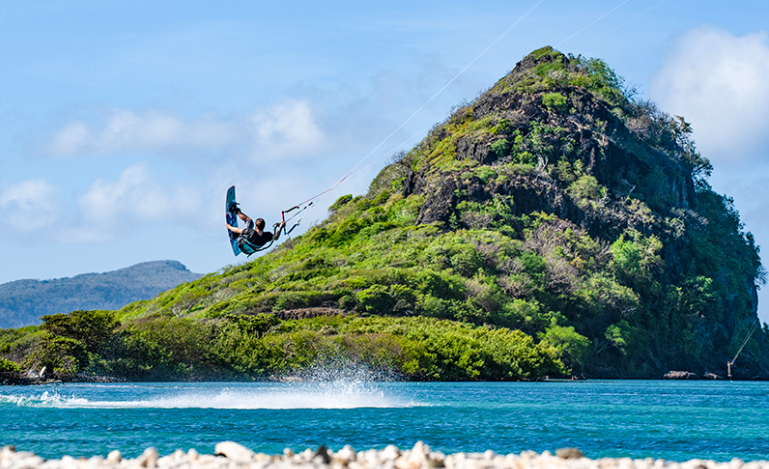 For me, kiteboarding trips are always exciting but this destination was always on my bucket list and I was super stoked to join the Slingshot team to shoot there. Every time we anchored we couldn’t believe it could get any better, until the next day when we went to another location! Transparent water, tropical nature everywhere along with perfect wind and fresh coconuts made this the ultimate trip. Sam to Alex: You’ve been to Union before, how is it different on a boat? Also, how has foiling changed this kind of trip? When I first went to Union I thought there was no possible way that life or kiteboarding could get any better. 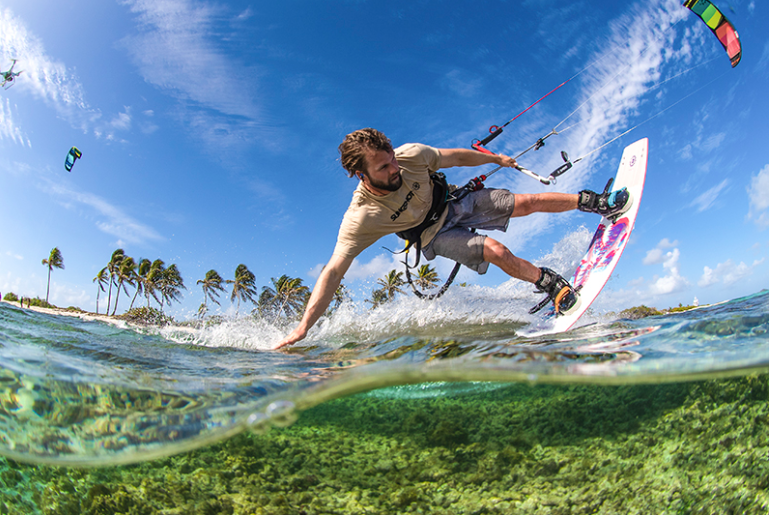 Union seems to be tailor made for kiteboarding. 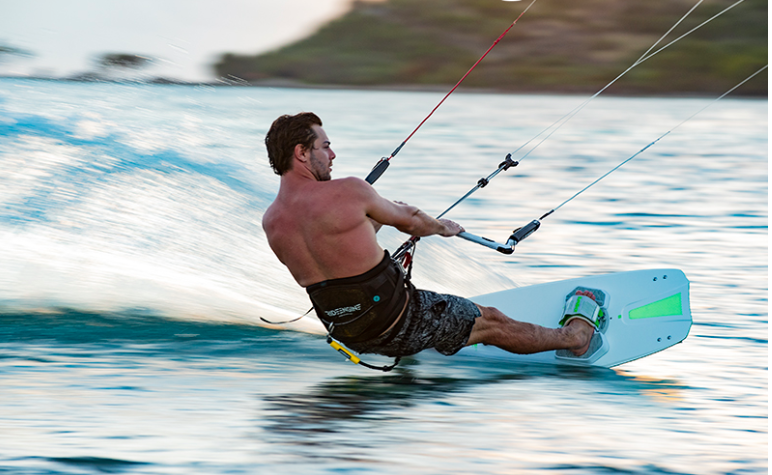 Perfect steady trade winds, protective barrier reef with a lagoon on the inside and nice kicker waves on the outside: it was a pure kiteboarding playground. I had always told Sam and the rest of the team that it was a full bucket list location. It was awesome to get to share it with more people on this trip. When I first went to Union we didn’t have access to a boat, so we rode pretty much exclusively on Union and if we wanted to explore we had to sort a boat for hire. So on this trip with the catamaran we took advantage, but I don’t know if we took full advantage. 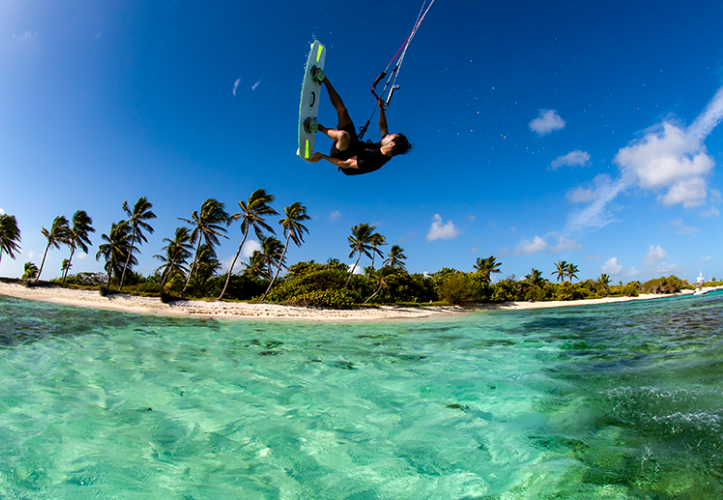 Union is just the tip of the iceberg really, the surrounding areas combined make it one of the greatest kiteboarding archipelagos in the world. With the Cartouche at our disposal we had full reign and access to anywhere and everywhere that we wanted to go. We packed in more locations in the six days on that trip than the full two weeks I had been there previously. It was quite the sensation to close your eyes after a few beers at night and wake up in an entirely new breathtaking location. The foil has changed photoshoots in a lot of ways. Number one is just being able to get kites in the air when normally you couldn’t. That’s such an amazing thing to have now, the insurance policy. Not only can you get kites in the air in conditions that normally you couldn’t but now you open up new locations. That’s extremely important as well. Maybe someone has shot a location before and blown it up but now you can capture these locations in a completely different light. It also helps to have such talented riders and the most talented drone pilot on the planet! By entering your information you agree to receive information from 7 Nation (parent company to Slingshot Sports).